Dies ist der erste Beitrag von "bilingual". Der Typecast wurde auf Deutsch verfasst, eine englische Übersetzung findet sich nach dem Unterbruch. This is the first post in the "bilingual" series. The typecast is German, but an English translation is provided after the break. 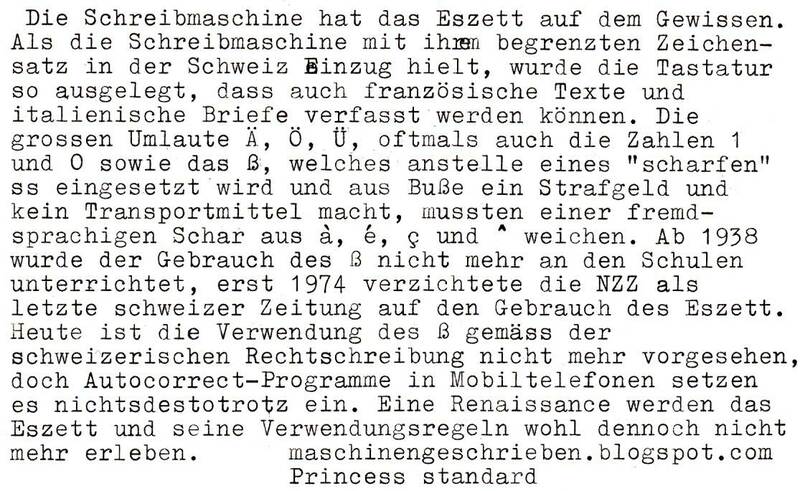 The typewriter has the sharp ss (ß) on his conscience. and 0 and the ß, which is used instead of a "sharp"
a foreign-speaking crowd consisting of à, é, ç, and ^. 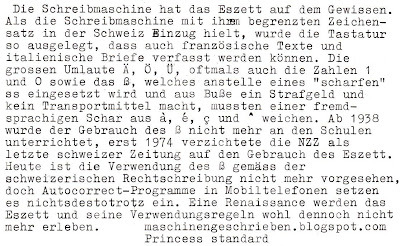 only in 1974 the Neue Zürcher Zeitung [swiss newspaper of record, very little change since 1930. wiki] renounced the use of the ß, being the last swiss newspaper to do so. usage rules won't experience a renaissance, though. Can you still get Translation Carbon Paper? If you slip it between two sheets of paper, then type in German, the carbon copy should come out in English - or any other language for which you have the appropriate carbon paper. Once again I've learned something from your blog, thanks!